Nigerian online comedian, Ebiye, is gradually printing his name on the walls of Nigerian comedy with the ability to invoke tears of laughter with short Instagram videos. Victor Ebiye now goes on to headline “Bag Of Emotions”, his very first live performance at the HardRock Cafe , Landmark Event Centre in Victoria Isand, Lagos. Almost effortlessly, Ebiye gathered an impressive fanbase in a unique way through the use of switching emotions during his performances. The comedian who was recently at NET TV explains that he decided to venture into comedy because he had remained unemployed for two years after graduating from Covenant University. 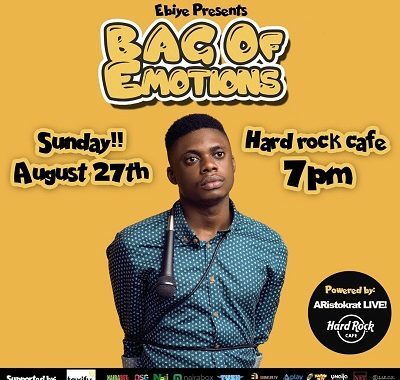 Planning to stage his debut comedy show, Bag of Emotions today, August 27, Ebiye says it will be the first of its kind, as he plans to host a show displaying different emotions. Denrele Edun has been announced as MC for Comedian Ebiye’s Bag Of Emotions. This show will have a some upcoming Nigerian comedians on its bill, and a couple of popular comedians will also take the stage in a night of music and comedy. The event is promoted by Aristokrat Live, an arm of the Aristokrat Group.